Hiya guys! I wish I could be happy and peppy after a nice long weekend, but I'm a little under the weather. Isn't that always the case with me? In this case though I'll admit it was totally my fault and I have no regrets! Long weekends in nice weather mean lots of BBQ food and well enough said, right? If there is anything I love more than polish that would food. But speaking of polish we have something extra special happening this week. Yup, it's that time of the month! Well hopefully not that time of the month, haha. It's Polish Pick Up time! Today I'm sharing swatches for Night Owl Lacquer's June contribution to the Polish Pickup Collaboration. This month the theme that was voted on is Video Games. Be still my heart! Let's go ahead and get right into the swatches! 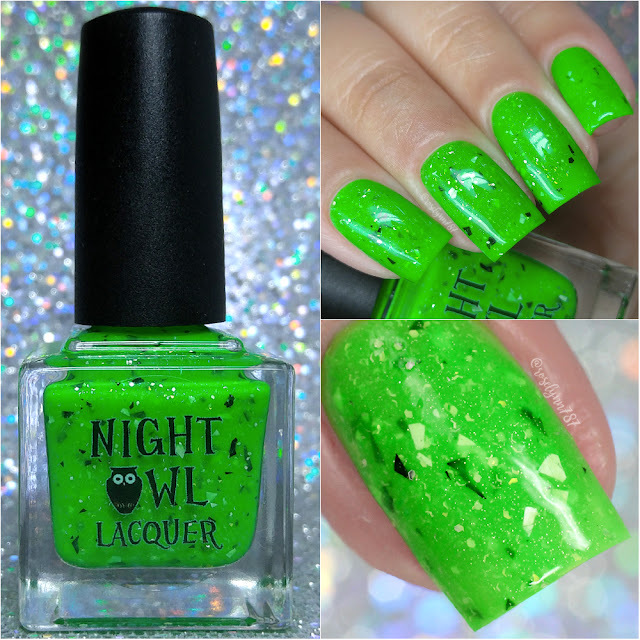 Creepers Gonna Creep by Night Owl Lacquer will be available for purchase through the Polish Pickup Shop Friday, June 1st at 11AM EST through June 4th. The full-size 15mL shade will retail for $9 each and there is no cap this month. If you're not familiar with the concept, the Polish Pickup offers a fun, interactive experience that allows you to submit theme ideas, vote for your favorite theme, and selectively purchase your favorite polishes every month. As I mentioned before, the theme that was voted for June is Video Games. This month Lindsay found her inspiration in the game Minecraft, specifically the green creature called the Creeper. 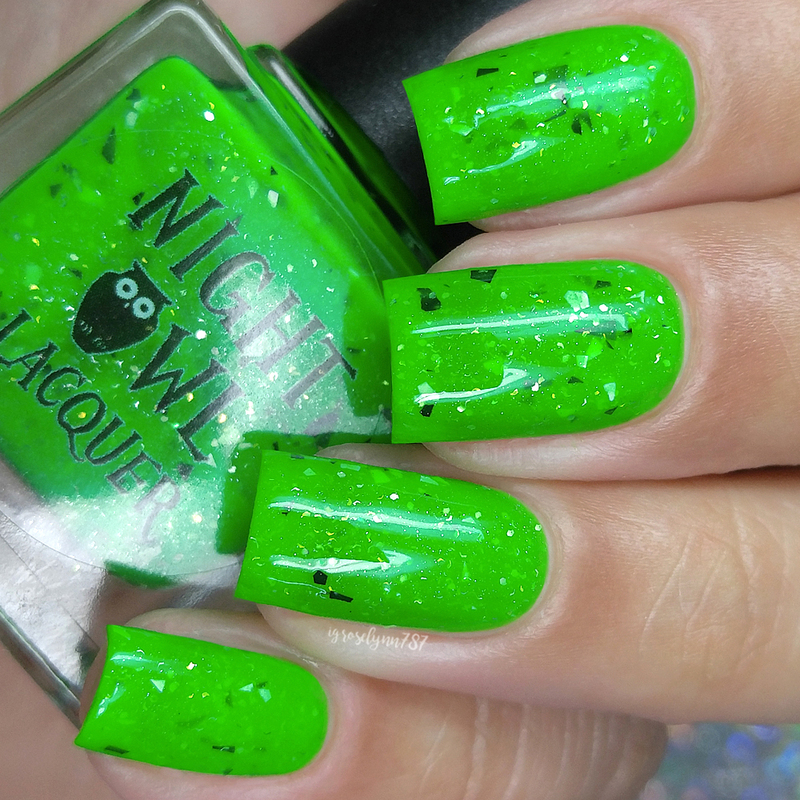 Creepers Gonna Creep can be described as a neon green with silver sparks and black, white, silver & lime green iridescent shreds. This shade also glows under black light, but unfortunately I couldn't test this out for myself. That said, holy moly is this beauty bright and so fun to wear! Dare I say it's even brighter than my photos. I was so surprised my camera didn't have a heart-attack trying to capture it, haha. It's definitely giving me all the right summer vibes and is a unique combination that is sure to catch some eyes. 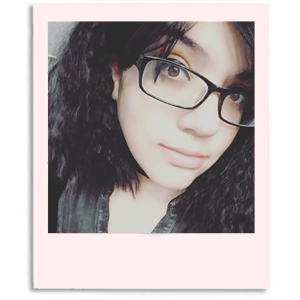 The shade also looks great against my skin-tone and doesn't bring out too much warmth. Such a pleasant surprise from a green shade as they tend not to be my go-to normally. The formula has a sheer jelly-like application that builds-up well for full coverage. In person you can see a slight visible nail line, but it's hardly noticeable on a glance. Consistency wise it's well balanced, not too thick or too thin. Plenty of glitter shreds per brush stroke without overwhelming or cluttering the nail. No need for fishing for the larger glitter pieces. It dries down to a matte gritty finish on its own, but smooths out perfectly after topcoat. I experienced no staining on removal to either my nail beds or cuticles. Shown here in two to three coats and sealed with a glossy topcoat. And with so much glitters and flakes, I couldn't resist giving it a matte topcoat to see how it turned out. Of course, I absolutely love how it looks matted! What do you think? 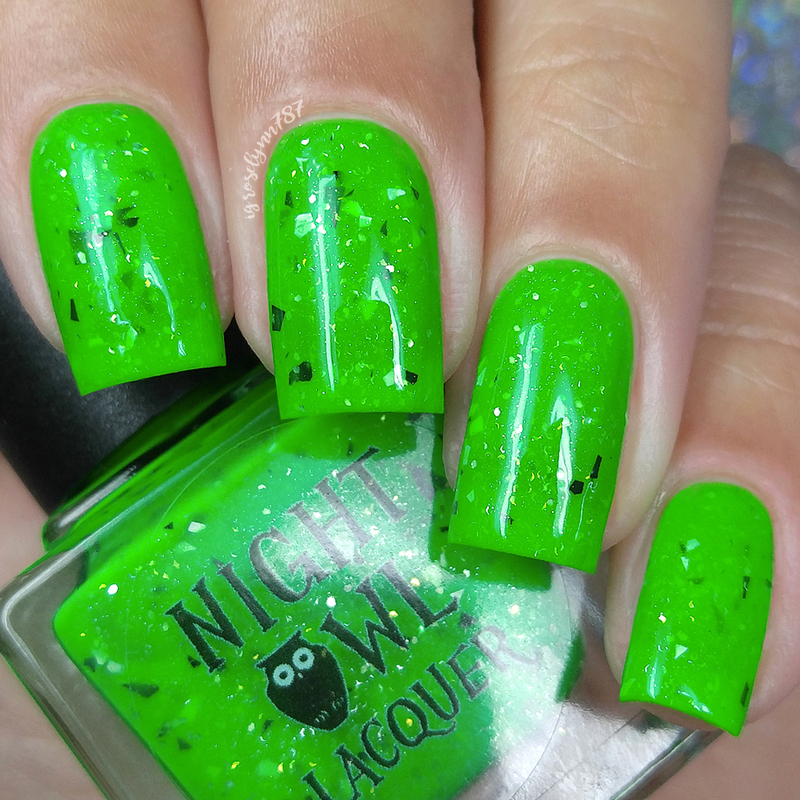 To recap, Creepers Gonna Creep by Night Owl Lacquer will be available for purchase through the Polish Pickup Shop Friday, June 1st at 11AM EST through June 4th. The full-size 15mL shade will retail for $9 each and there is no cap this month.